Lisa was last seen wearing a white t-shirt top with lettering on the front, cream tracksuit bottoms and white furry "moon" boots (boots shown in above far right photo). Unknown. 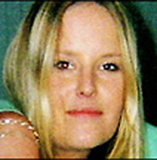 Lisa was last seen at a party on a caravan site in Ballyhalbert, Ireland on February 28, 2005. Police believe she was murdered and that her body was moved out to sea some months after she was murdered. The police appeal to people in the sailing or boating community to come forward if they have any knowledge about a distinctive boat, a red Skeeter 550, and its movements over the last week in July and first week in August 2005. Dorrian's case remains unsolved.